At John Moriarty Football our Scholarship Program is about creating opportunities for talented young elite footballers who have a dream to pursue both their education and football in Sydney. It is a radically life changing opportunity for those talented young footballers in our program who show exceptional sporting ability. Our partner schools include Westfield Sports High School, Hills Sports High School, Endeavour Sports High School, SCEGGS Darlinghurst and Waverley College. We operate on a home-based model, where families board our young athletes. Our young students who come to Sydney are quick, intelligent, aware and creative. However they are amongst Australia’s most vulnerable children, with very wide disparity in educational attainment. They do not have even the basics of a foundational schooling. Our first move is often to resource intensive support teaching for English as a Second Language (ESL). But here’s the revelationary point. Our methodologies are making it possible to close the academic differential quite quickly, even with children who are a long way behind. Our results are coming from exceptional school and host family relationships, and intensive, culturally-cognisant tutoring – sometimes up to five times per week – with one-on-one, short bursts, stimulating content, creative learning, momentum in sessions and a leaning towards maths, science and technology. It’s even more effective if they’ve been to training or had a run prior. It is a radical new look at Aboriginal education. Shay was scouted by the Australian national women’s coach Alen Stajcic in 2015, when she won a place at leading Australian sports high school, Westfields, in Fairfield, Sydney. Through a John Moriarty Football scholarship, Shay is the first in her family with the chance to complete a high quality Year 12 and contemplate university. It was out of her reach back home in remote NT. 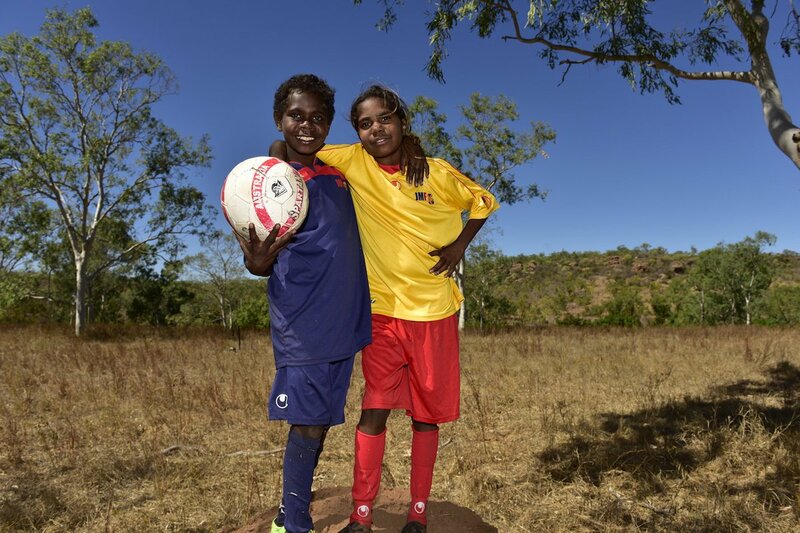 Shay is a prodigious sporting talent, and may even represent Australia in football on the way through. Now nearing the end of her second year in Sydney, Shay’s belief in her own potential has become unshakeable. She has been awarded for academic achievement, secured a place at the NSW Institute of Sport in 2016 and 2017, and won the Player’s Player trophy on the 2016 Westfields Sports High School competition tour to the USA. 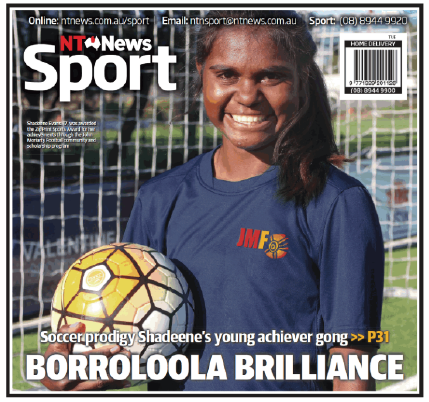 Already creating a legacy at just 15, Shay has inspired six more of her young peers from remote NT to take their own journey of opportunity. In mid 2016, at 13 years of age, Brenda came to Sydney to trial and was accepted into the elite football stream at Hills Sports High School. Now 14, 2017 is proving to be a big year for the keen footballer, where she is kicking goals at school and on the field. As one of our most talented young players, we are looking forward to seeing all that Brenda can achieve in Sydney. Brenda has taken full advantage of tutors who have kindly donated their time to work with her up to four nights a week. Brenda has shown great dedication with her academic learning and football training. This season she has been playing with local side Rooty Hill, and was selected to train at NPL1 club Blacktown Spartans. Brenda is a versatile player who creates a lot of opportunities regardless of where she plays on the field. Whether she’s in the backline or upfront, Brenda is always making a play towards goal, often scoring herself. 13 year old Trishanne “Sharney” Miller was awarded an Indigenous scholarship to attend Year 7 at leading Independent girls school, SCEGGS Darlinghurst, in 2017. She is the first Indigenous scholarship holder at the school to come from a remote bush community. Trishanne was selected to play for NPL1 Club Northbridge FC for the 2017 season. Although she has spent the majority of her young playing career taking care of things on the backline, Sharney’s powerful right foot is currently being utilised up front as striker. Sharney is an outgoing young girl with a curiosity for new places; a leader in the making. Since starting at the school, Sharney has taken full advantage of tutoring and classes, as well as co-curricular activities from guitar and choir to football and gymnastics. Sharney lives with her host family in Greenwich and is enjoying living in this tight-knit community. 13 year old Jeremy Herbert is our second scholarship holder to be awarded a place at Waverley College. With extended family already in Sydney, Jeremy looks forward to gaining a top-notch education and pursing his football. Jeremy is a sports aficionado, in particular football of course, and rock climbing. He lists cooking too as a favourite thing to do. Jeremy was selected to attend our inaugural Indigenous Football Week celebrations in Sydney in 2016. Alongside twelve other JMF players, Jeremy was lucky enough to walk out onto the pitch with the Socceroos for a World Cup qualifier against Jordon. Jeremy will benefit from being at Waverley alongside two other JMF scholarship holders, where they’ll support each other as they transition to Sydney life.